It wasn’t that I was looking for peace. But I did expect some kind of “wow” moment. Some kind of spiritual release or holy epiphany. After all, Jesus was my Saviour too. Instead there is only one reason I would go back to Bethlehem and it doesn’t have anything to do with witnessing the birthplace of Jesus. 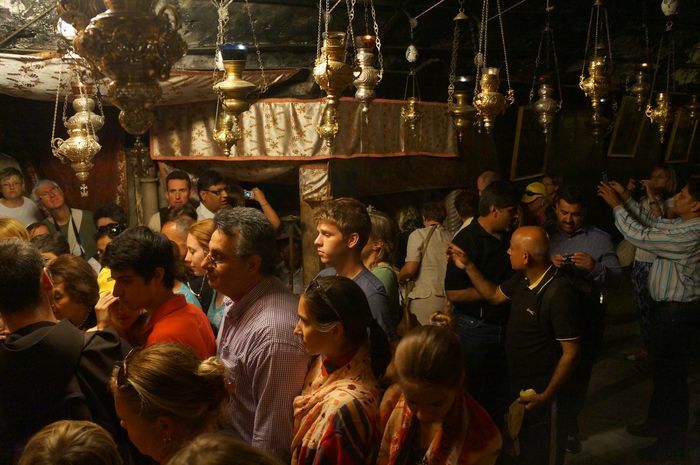 Abraham Tours’ day trip to Bethlehem sounded fascinating. We had never been to Bethlehem on our previous trip in 2007 mainly because my mother-in-law is Israeli and, quite possibly, would not be allowed in to the West Bank. But we were going to do it. 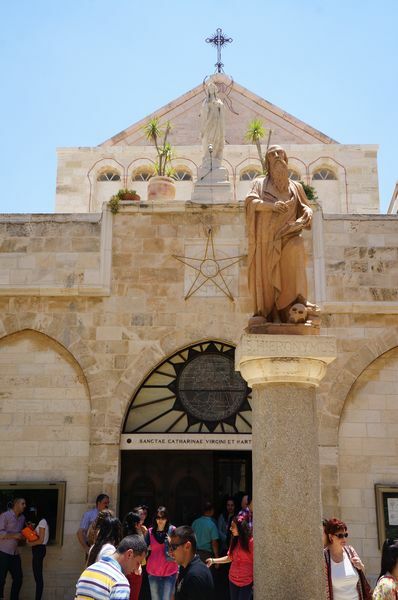 I was nervous and excited at the same time, as any new place does to me, especially one with a history as rich as Bethlehem. The drive is not long and the border crossing into the Palestine Territories was very easy with no one stopping us. We picked up an Arabic tour guide and made our way to the first stop. Unlike most tours our guide was very matter-of-fact. Every place he took us was not the possible Jesus-related site, but the actual one. Our first stop was supposedly where the shepherds saw the first star in the night sky proclaiming Jesus’ birth and where the angel came to them. We got to see the field where they tended their sheep, complete with real-life authentic sheep. And also entered the cave where they supposedly lived. There was a beautiful church filled with people for Saturday Mass and they started singing Silent Night in German (I believe). It sounded heavenly, like a chorus of angels. I could almost close my eyes and imagine what it would have been like on that starry night. After our visit to the field we were off to the birthplace of Jesus. The journey got mighty interesting as we climbed higher and higher into Bethlehem. At one stage our bus tried to climb the steepest road I have ever seen in my life… and failed. The foot was down hard on the pedal, the engine was roaring, but instead of moving forward we were stuck in one place and even sliding backwards slightly. The bus ended up reversing back and trying a different way. Did you know Jesus was born in a cave? Contrary to the belief that he was born in a shed (stable)? 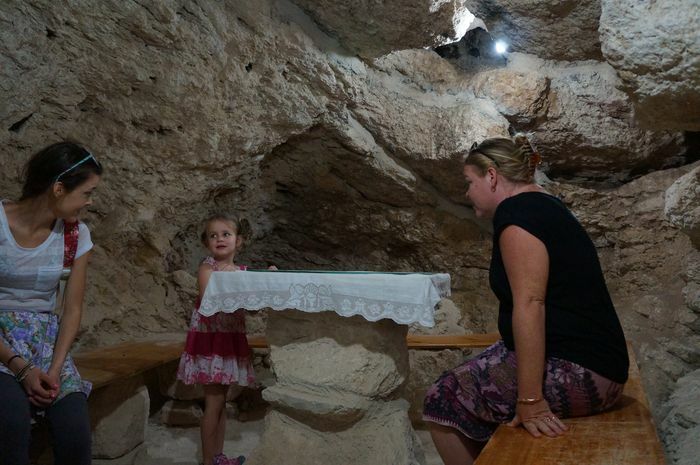 Guess what has been built on top of the cave… a church, yep, you got it. And not just any church but a piece of history that is fought over by several factions so the church is amazingly split into 3 sections – Eastern Orthodox, Armenian and Catholic. When you enter the Church you are first distracted by the beautiful gas lamps hanging from the ceiling and then drawn to a crowd. 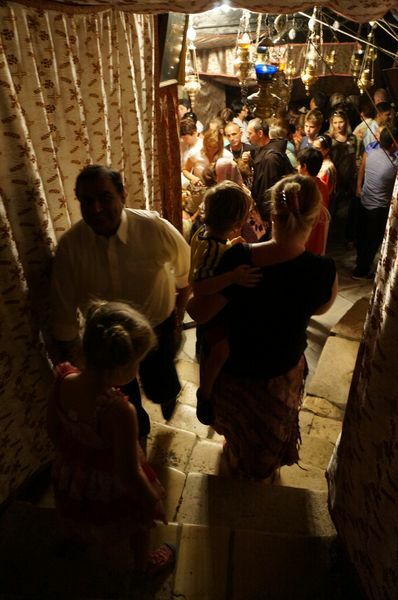 A long line of people waiting to enter the cave and witness the birthplace of Jesus. Thankfully our guide was very proactive and because of our children allowed us entry at the exit so we did not have to wait in line. The exit is beautiful and we descended down the stairs in awe to be finally here. The room was crowded and hot. It was filled with devout individuals who were keen to kiss the sacred site. They seemed to be doing it in a sort of mass hysteria and a sense of a duty. Not that I can read their thoughts, but the religious fervor in their eyes was a big clue. In the cave is a silver star dating back to the 1700’s provided by the French king. This was the surface that was receiving all the kisses. Mia didn’t quite understand what people were doing and simply pushed through the crowd to take a close look at the star. I sat there waiting for my divine anointing, but felt nothing. The place of Jesus’ birth was not at all what I imagined. There was no more “away in a manager, no crib for a bed” Christmas carol. No hay and cute animals, just the stink of human body odour and heat from an overstuffed cavern. The pictures on the wall were interesting to look at, but soon the heat and bodies got too much and we made our way out of the cavern. The rest of the church was elegantly decorated according to the different denominations. Our guide walked us through some of the history and information about the area before we departed the Church into the midday sun. 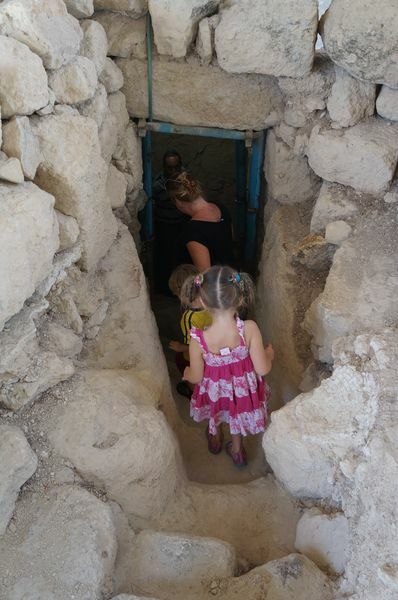 Interestingly one of the nearby caves, also below the church, is thought to be the location with King Herod disposed of the bodies of infants he apparently killed in the search for the messiah. 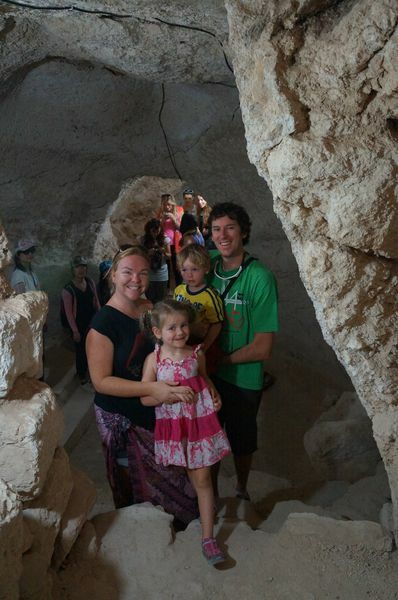 It also happens to be the same cave that the bible was painstakingly translated over a period of 37 years. Now that’s a tough job. We walked only a little while before escaping into a typical “best priced” shop in the town. Clearly a kickback to the tour guide, but nevertheless they were very hospitable offering us bread and a drink on entry and while we shopped. I found the perfect gift for my mother who collects Christmas ornaments. Where else to get the best Christmas ornament in the world than in the birthplace of Christmas? Beautiful hand-carved olive-tree wooden ornaments. After this stop we took a walk to the Milk Grotto. 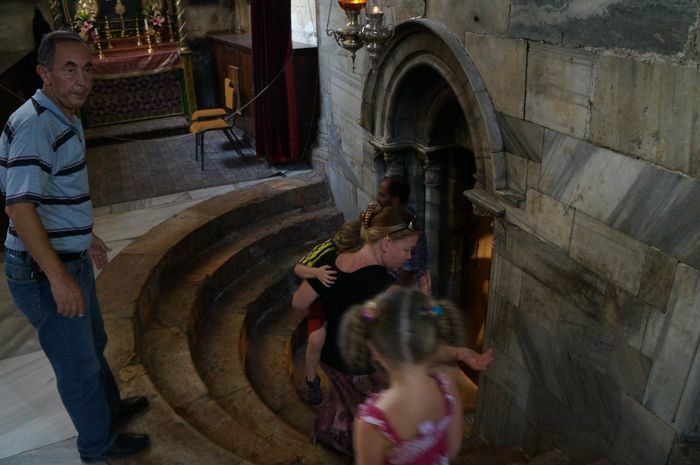 I had never heard of this place before, however legend has it that a drop of Mary’s breast milk that she was feeding Jesus with fell to the floor and turned the black stone cave to white. There wasn’t much to see, but it was an interesting story. Finally we all got back to our bus for the final stop near the West Bank border for Palestinian wall art. While our tour group was snapping pictures of the intricately decorated wall, with juxtaposing messages of peace and hatred, we also stopped nearby in a small shop for ice cream and drinks. The two ice creams I brought cost 2NIS (AUD$0.60). These same two ice creams in the Old City in Jerusalem cost me 10NIS (AUD$3.00)! I was in shock! How could one city only minutes from another be so much cheaper? We all went back for seconds. And while I certainly did not intend to be in awe of Bethlehem because of its ice cream prices we did agree that next time we wanted ice cream we would drive to Bethlehem for it. Shameful, isn’t it? Our bus returned us to Abraham Hostel where we spent the evening checking out the Shouq (market) and dreaming about cheap ice cream in Bethlehem. The Dead Sea - Kid's Worst Nightmare or Dream Come True? I can imagine it would be hard to feel any type of religious epiphany when something sacred has been turned into such a tourist-trap. Seriously--it would have been a much different trip had it been private, without anyone else wanting to see it (HA! ), and I imagine even visiting the cave would have been very cool--had it not been covered in a very elaborate church packed full of people! ::sigh:: Sometimes preservation comes with tourism...well, at least preservation of the place, itself. Good and bad! Make hummus not walls...love it! Loved the pictures! How come we are told Jesus is born in a stable if He was actually born in a cave? Strange! Your pictures are wonderful! 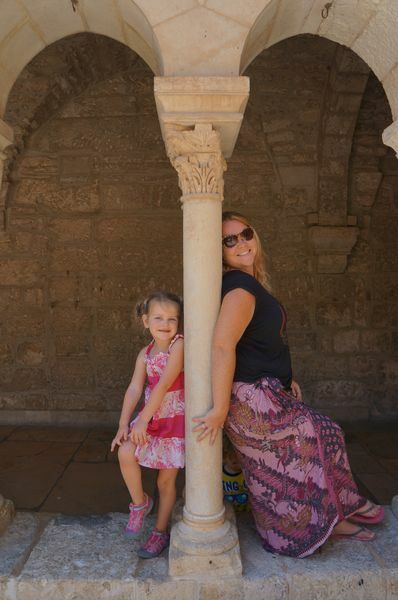 When is the best time (no crowds and cooler temperatures) to visit Jerusalem? Are you allowed to bring your own drinks and food on tours? It must be awe inspiring to actually see the "true' sites link to Jesus. Reminds me of the number of times I have seen The Holy Grail in different churches around the world. They all claim to have the 'one true cup'. Who am I to disagree. Thanks for all of the information.